In 1887, a Denver priest, two ministers and a rabbi recognized the need for cooperative action to address their city’s welfare problems. The Rev. Myron W. Reed, Msgr. William J.O’Ryan, Dean H. Martyn Hart and Rabbi William S. Friedman put their heads together to plan the first united campaign for ten health and welfare agencies. They created an organization to serve as an agent to collect funds for local charities, as well as to coordinate relief services, counsel and refer clients to cooperating agencies, and make emergency assistance grants in cases which could not be referred. That year, Denver raised $21,700 and created a movement that would spread throughout the country to become the United Way. Over 128 years later, United Way Worldwide is still focused on mobilizing the caring power of communities and making a difference in people’s lives. Beginning its work in the Mount Vernon area in 1951, local volunteers came together for a one day campaign to raise $50,000 for five Mount Vernon Community Chest member organizations. The following year, volunteers expanded their fundraising efforts and outreach into a county-wide United Community Chest effort raising $70,500. The organization changed its name to United Way of Knox County and became affiliated with the national United Way movement. Our volunteer-driven Women United group was founded in 2015. Membership is open to all women seeking an outlet to get involved in the community. The group hosts hands-on projects, volunteer opportunities, and networking events. It is funded through the Annual Power of the Purse Fundraiser, which allows flexibility in program investments through Women United Grant Application process. 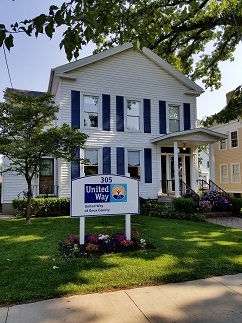 United Way relocates to our new home at 305 East High Street in Mount Vernon. Since 1951, local volunteers have been responsible for raising more than $20 million to impact the quality of life for Knox County residents. Each year, United Way of Knox County Ohio, Inc invests in local partner agencies to deliver much needed programming in the areas of Education, Financial Assistance, and Health. The United Way staff also directly administers several local programs in those same priority areas.